There comes a time in every player’s life when his skills finally leave him. It’s often not really possible to pinpoint exactly when that moment is at the time it’s happening, especially in a game as streaky as baseball, but sometimes you can go back through the statistics and maybe figure it out. For Alex Rodriguez, many point to his 40th birthday as the day his bat lost it’s mighty wallop power… I think it’s a couple of days before that. Let’s go back and take a look at a game that happened just last year–a game we might have to consider to be Alex’s last big day. 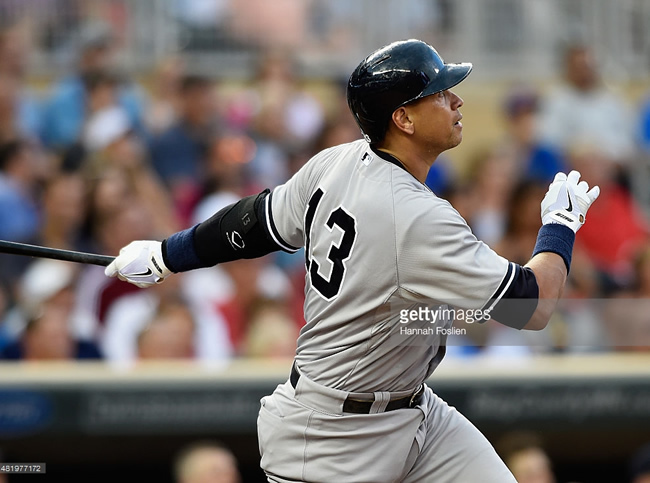 It was late July, and the Yankees headed to Minnesota to take on their favorite whipping boys, the Minnesota Twins. The Twins beat the Yankees in the first game of the series, and the Yanks, who were still in first place at that point–this was before the Blue Jays made all their crazy trades at the deadline–wanted to even up the series and take back the momentum. They sent their struggling former ace, CC Sabathia, to the hill hoping he could right the ship. The Twins, meanwhile, countered with Tommy Milone. Sabathia immediately imploded, giving up a 2-run homer to current Yankees flop outfielder Aaron Hicks in the first, and a 3-Run homer to old man Torii Hunter in the third. Just like that, the Yankees were down 5-0. The Yankees got cooking on a comeback attempt in the top of the fourth, when Alex, who had grounded into a double play in the first, hit a two-out 452-foot solo home run to the third deck in left-center. The dinger got the Yankees on the board, although they failed to make any further inroads in the inning. They didn’t score in the fifth or sixth either, but managed to fire the burners back up in the seventh. Chris Young, whom the Yankees probably regret letting go in favor of Hicks right about now, doubled to lead off the inning. That brought up Alex, who hit a 1-1 pitch for another home run. This one landed 420 feet away in left-center, and it pulled the Yankees within two runs, at 5-3. They tacked on another run in the inning on a sacrifice fly by Chase Headley, which set Alex up to be the hero again in the ninth. When the time came to nail down the save, the Twins turned to closer Glenn Perkins to get the job done. Unfortunately for him, no one told him that this was meant to be Alex’s last big day, and not a Glen Perkins save day. Without wasting any time, Alex jumped all over a first-pitch fastball. When it touched down 438 feet away–this time to straight away center–the game was tied, and Alex had his fifth career three home run game. The balls traveled a combined 1,311 feet. What a performance. The Yankees would score three more runs in the inning, after John Ryan Murphy followed singles by Mark Teixeira and Headley with a 3-run home run to right-center to give the Yankees the lead, and the eventual win. In the grand scheme of things, this wasn’t a big win for the Yankees. At the time, it might have been, but the way the season turned out this was just another win in yet another disappointing season under Joe Girard’s managerial care (by the way, can we end that this offseason?). It’s a deeper analysis of the numbers that shows us why that game was so important. That was the day Alex Rodriguez really stopped being Alex Rodriguez. Prior to that game, Alex was hitting .277/.375/.539 with 23 homers and 58 RBI in just 85 games. Up to that point, he had been a godsend–a home run machine that had helped carry the team to first place in the American League East despite not having had a major league at bat in over a year. His surge was damn near miraculous, especially considering he was 39 years old. The numbers after this game tell a completely different story. From July 26th on, Alex was a shell of his former self. In 61 games the rest of the way, he hit .208/.326/.401 with 10 homers and 28 RBI. While the home runs and OBP actually aren’t terrible, you can clearly see that his offensive game tanked after all those homers. Maybe the summer grind just finally got to him, and that’s what caused his prolonged slump, but that wouldn’t explain why, after resting for the entire offseason, he’s put up nearly identical numbers in 2016. Through 62 games this season, the slugger has only managed to hit .204/.252/.356, with just 9 homers and 29 RBI. The numbers are nearly identical to the ones he had after his big game. This means that, over the last calendar year, Alex has barely managed to keep his average over .200. Not a good look. Look. I don’t know if something really did happen in that game to cause Alex’s powers to be sapped from his body. I don’t think that was one of those scenarios where he went out there one last time to take the team onto his shoulders and leave everything out on the field, as the cliche goes. I don’t know why his abilities basically shut down after that game. All I know is that, to me, this was the last time Alex hit like the man we grew to know as AROD. It was the night he homered, as Mr. Burns would say, not once, not twice… but thrice!